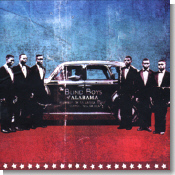 The new CD from The Blind Boys of Alabama, Spirit of the Century, is stunning, and easily made the cut as this month's Pick Hit. Walter Trout is drawing raves as the latest guitar hero around the blues/rock world. His latest, Go The Distance, is our June Surprise feature. A wonderful re-issue of Smithsonian recordings from Delta bluesman Honeyboy Edwards is this month's Flashback selection. This month's What's New section features new releases from Ike Turner, Ervin Charles, Buddy Guy, The HooDoo Kings (a trio of Louisiana superstars), Arizona's Big Pete Pearson, Leon Redbone, and more, as well as fine re-issues from Johnny Adams, Lightnin' Hopkins and Geoff Muldaur.